A bit of group history – We are a friendly women’s Morris dance side, which began in 1981. The side was founded by the wives and partners of the Stony Morris men as they didn’t want to be left out of the dancing. Unfortunately the Stony Morris is no longer in existence, but we are, and celebrate our 30th anniversary this summer. We still have one founding member dancing with us. The name, Old Mother Redcap’s, was taken from an old map depicting the pubs of Stony Stratford. An Old Mother Redcap was an alewife, who held a brewing licence, and so it is a relatively common pub name in the UK. Despite the name, the side has never worn any headgear, although red is prominent in our costume and shoes! Our logo has also remained the same throughout our 30 years, and is used by the musicians and on our earrings, badges and banner. 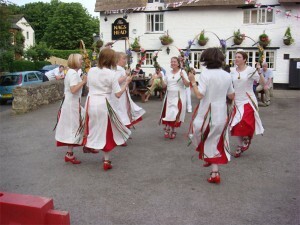 Main activities – We dance Manx traditional dances, and ‘garland’ dances. Over the 30 years, our styles of dance have evolved, owing to the number of dancers and experience of the side. We now dance Manx traditional dances and are very pleased to have two former inhabitants of the island dancing in our side. We also dance garland dances, some originating from France, which the side have adopted over the years. We have melodeon, accordion and pipe musicians, and play drum and percussion to accompany. Our costume – The side is on its fourth costume design, the last being created by members of the side in 2009. Throughout the 30 years we have always worn red shoes. We now wear a cream dress with red petticoats, green shawl and ribbons in our colours of red, green and brown. We all decorate our own shawls using our side colours in whatever way we like and our musicians wear waistcoats decorated in our ribbons. Membership – New women members and new musicians (male or female!) are always welcome. We have members from Stony Stratford, Milton Keynes and the surrounding area, and meet on a Monday evening in Stony Stratford. Traditional local events and festival participation – We enjoy dancing out at community events and private functions throughout the year. Our season always starts on St George’s Day in April at Stoke Bruerne, when the Rose and Castle Morris invite local sides to an evening of dancing and music on the canal side. We always help Stony Stratford, our home town, home town, celebrate their Stony Live arts week in June and their Christmas Stony Lights celebration (with lots of layers under our shawls!). We also dance at other festivals and fetes in the local area, and enjoy meeting and dancing with other sides throughout the summer.